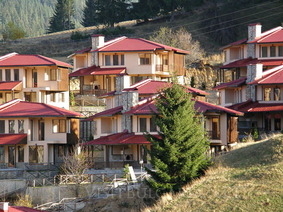 Rodopi Houses holiday village in Chepelare mountain ski resort in Bulgaria. Book hotel in Chepelare online. Location: “Rodopi Houses” Holiday village is situated in the southwestern part of Chepelare on a total area of 5.4 decares land plot. The village consists of 20 individual houses, all of them stylishly furnished. Accommodation: Each house offers individual yard, fitted kitchen, dining table and a living room with a fireplace. The houses also offers a vast veranda with a barbecue. The village offers free parking lot, Internet and cable TV. There is also a reception desk and security guards. The settlement is situated in close vicinity to a pine three forest with numerous eco trails, suitable for tourism during the summer months. Additional servicies: A 4 star hotel with a spa centre and indoor swimming pool is located in close vicinity to the village and can be used upon additional discount charge. Food catering fro several restaurants located nearby can be supplied upon demand. There is an option for return transfers to the lift in the resort. A mini football playground and volleyball, handball and basketball hall is also available.